Weaver Creek Community is a new premier luxury apartment community offering high end and spacious apartments in Springfield, MO. Nestled off of the beaten path, we are close to all the things you need without the congestion of inner-city traffic. We are located close to Andy’s frozen custard, pet warehouse, the library center, the local bus stop, Sam’s club, academy sports and much more. 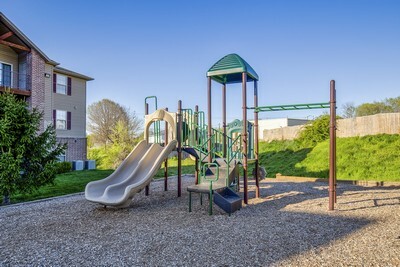 We offer many amenities at our apartments in Southwest Springfield MO including: walk in utility rooms, wood laminate flooring, frieze twist carpeting, warm and inviting wall colors and fully equipped kitchens. Additional luxury features include free movie rentals, free tanning, free gift wrapping, a free 24 hour fitness center, a fully furnished guest suite (fees apply) for your visitors and so much more! 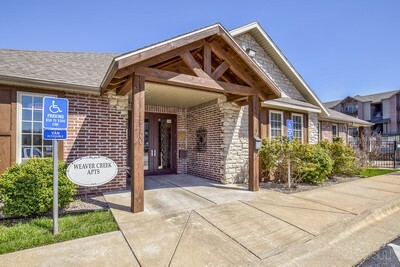 Whether relaxing in the resort style heated pool and hot tub or enjoying the comfort and convenience of the club house, you’ll appreciate the assured quality of life Weaver Creek brings to premier apartment housing in Springfield MO. 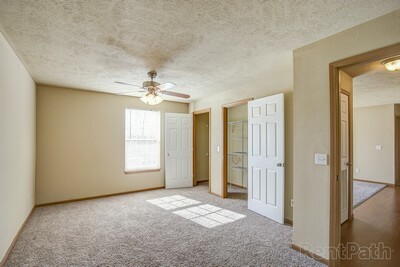 Weaver Creek Community offers 1 to 3 bedroom rentals in Springfield MO. In addition to all the amenities, we also include Water, Sewer, Trash, Maintenance, High-Speed Internet, and Expanded Cable. We also offer security features like a nightly security patrol and all the doors have dead bolts. Weaver Creek Community also allow pets with certain restrictions. That’s why our motto is “Love Where You Live”! When you’re ready to find an apartment for rent in Springfield MO, give us a call at (417) 883-9522 and we’d be happy to answer any questions you have. Are You Looking for Pet Friendly Apartments? Weaver Creek Community offers pet friendly apartments in Springfield MO so that you and your fur babies can live in luxury together. There are a few guidelines concerning pets you need to know, however. Only those pets on the lease may occupy the premises. Only 2 pets per apartment. Pets cannot be over 30 pounds and must be housebroken. Only non-aggressive breeds of dogs are allowed (no pit-bull, rottweiler, etc.). There are pet waste stations located throughout the property for your convenience when walking your pet. Pet fees are $300 one-time (upon lease signing) and $25/pet/month. If you have any questions regarding our pet policy, please call us at (417) 883-9522. Intrigued by our amazing amenities? You can start the rental application process right here. Just fill out our online application and pay the one-time fee of $30. If you’re curious about how much our apartments for rent in Springfield MO run, you can find that out by visiting our prices, deposits, and fees page. The page also has information on security deposit fees, pet fees, and lease terms. If you have any questions, you are always welcome to call or visit us at our luxury apartments in Springfield MO. 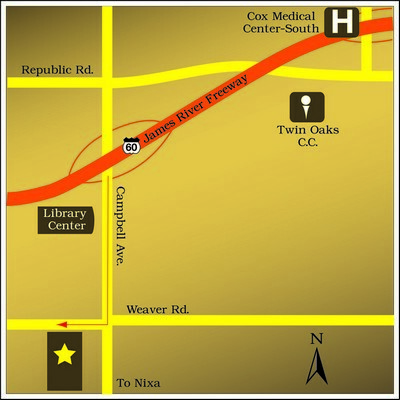 We are located on Weaver Road just south of James River Freeway off of Campbell Avenue. *Ask about our Special Promotions that we have going on now!